Mike Verhoef, the owner of Fly Fitters guide service since 2003, fishing the rivers of SW Ontario and specifically along Ontario’s West Coast. Mike was Introduced to a two hander in 2004 by a couple of fellow Gloomis pro staffer’s and quickly realized the benefit these long rods and line set ups would have to pursue steelhead on his home waters of the Maitland River! Mike was “hooked” and has been spey fishing ever since! He now spends anywhere from 60-80 days a year spey fishing and guiding clients with two handers! From his home steelhead water in SW Ontario, to the Atlantic salmon rivers in New Brunswick and his cherished couple weeks a year in Skeena country of British Columbia! You can learn more about Mike and what he offers on his www.flyfitters.ca website, or google him on youtube to see a number of his TV appearances from over the years, and also be sure to check out his www.speyfishingontario.ca website. 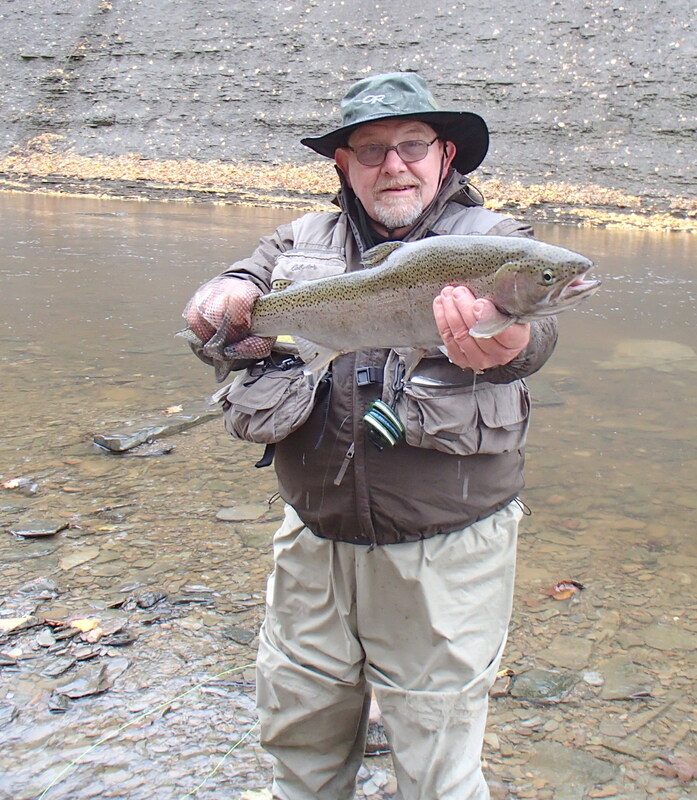 If you have an interest in learning about the steelhead fishing on the north shore of Lake Erie, Mike will be on hand to answer your questions. O.C.B.S. supports and volunteers for the following projects. It is always important to clean up the rivers we fish. It is also important to help develop future fisher-men and fisher-women by supporting and volunteering to help and teach at metroparks kids days programs. Congratulations to John Rhoades First Place winner of the 2018-2019 OCBS Championship Series Steelhead Tournament. John’s Largest six fish total measured 161.5 inches. Ken Harper captured second place with six fish totaling 158. inches in length. Adam Hillman placed third with six fish measuring 157.25 inches in length. Awards will be presented at the 7 April 2019 Membership meeting at BW3 in Strongsville followed by the Tournament Raffle. Mark your calendar and plan on attending the event. The 5th Leg of the OCBS “Members Only” Steelhead Tournament was held on Sunday 7 April 2019. A bright beautiful day with temperatures in the high sixties. The Legacy streams were in decent shape and held good numbers of fresh and holdover fish. Water temps were in the upper forties and the bite was rather slow. A total of 16 fish 24 inches or greater in length were checked in for the Tournament Leg. All in all a pleasant day to be out on Steelhead Alley. Congratulations to John Rhoades who placed first with two fish measuring 32.50 and 28.50 inches. Justin Telep and Ken Harper placed 2nd and 3rd respectively.